National Japanese American Memorial, "Golden Cranes"
The National Japanese American Memorial, "Golden Cranes"
The National Memorial to Patriotism is situated 600 yards from our Nation’s Capital. It is a universal symbol of strength, hope and unity to people from all cultures and nationalities and serves as a testament to the patriotism of the Japanese American community. Engraved on the granite walls are the names of the internment camps that were located in the Midwest and Western United States during World War II. A total of 120,000 men, women and children of Japanese ancestry were incarcerated, three quarters of them were American citizens. The number under each camp name corresponds to the number of internees held. Also engraved on the walls are quotes by politicians and the list of names of the Japanese American soldiers who served and gave their lives for this country. A total of 30,000 Japanese Americans served in the military. Both of my parents were born American citizens in Hawaii, both spoke English fluently as their only language. My father Ah-Kui Akamu was half-Chinese and half-Japanese. He served in the United States Air Force for 28 years, retiring as a Senior Master Sergeant. My mother’s family was deeply affected by the internment. At the outbreak of WWII, immediately after the bombing of Pearl Harbor, all Japanese community leaders, school teachers, preachers and business people were arrested by the FBI. My Mother’s father, a storeowner living in Hawaii for 40 years was ill with diabetes when he was arrested. He was sent to a relocation camp on Sand Island in Pearl Harbor. Without proper medical care, he suffered a fatal heart attack within 3 months of being incarcerated. I lived in Hawaii for 8 years as a young child. On weekends my Father and I would go fishing in Pearl Harbor. Buildings surrounding the harbor were riddled with bullet holes. Our small boat would pass over the ominous dark shapes of sunken battle ships partly submerged in the water. Spots of oil would float to the surface, creating translucent colored rings, a small visual clue as to what lay beneath us. From 1966 to 1969 we lived in Japan. It was here that I was first influenced by various traditional art forms in painting and sculpture. The diversity of materials, meticulous craftsmanship, refined aesthetic sensibilities and pervasive spiritual quality expressed in Japanese art made a lasting impression on me. After receiving my BFA from the Maryland Institute of Art, Baltimore, Maryland, I moved to Florence, Italy for 5 years to sculpt and study Italian Renaissance masterworks with my mentor Joseph Sheppard. We then moved to Pietrasanta, Italy on the Northwest coast for 7 years. Pietrasanta has been known for centuries as an international mecca for marble and bronze sculptors. Oddly enough, Pietrasanta and the nearby town of Massa were also where the Gothic line in Italy was during WWII. The Japanese American soldiers landed on the beaches 5 miles away and climbed the steep mountains as they attempted to push the German soldiers back. A few years after I left Pietrasanta, a monument to a Japanese American soldier was erected 300 yards from where I had lived. It is the only monument of its kind in all of Europe. As a third generation Japanese American, I was distanced from the traumatic events of the past. Having been commissioned to create the centerpiece sculpture, I studied references on the Japanese experience during WWII. I read history, watched archived videos and listened to the recollections of Japanese American veterans and internees. I studied photos of an alienated people caught in a dark and desolate moment of time. There was a common thread in the fabric of these personal histories, yet each experience was uniquely woven. The experiences of my family’s tragedy, the resonance of places, the accounts and memories were powerful inspiration for the creation of a sculpture. I understood how much this Memorial meant to a community that had suffered so terribly in a time of war hysteria. Although the sculpture has references to this particular community and their experiences during the war, its symbolic impact frees it from the confines of a specifically ethnic-bound life experience, encouraging the inclusion of each individual, society, and humanity as a whole. Since preliterate times, the image of wings and the bird in flight have been universal symbols associated with freedom and transcendence of the human condition. More specifically, certain species of birds are endowed with unique significance. The American Bald Eagle represents the spirit and strength of the United States. The white dove has religious and peaceful connotations, and the owl is synonymous with wisdom. Over the centuries, the Japanese crane has been widely depicted in Asian art and literature, representing happiness and longevity. Cranes were personified in folklore, having been given those noble qualities for which humans strive. On one level, the inversion of the symbols of happiness and freedom and the use of barbed wire represent the internment, injustices and sacrifices suffered by Japanese Americans during the war. The crane holds specific significance for this particular community, but its message is not simply ethnic. Humans share recognition of the universality of suffering and a longing for freedom. Therefore, the sculpture is also an evocation of strength and a testament to the power of the human spirit. The identical position of the birds’ bodies represents the dualistic principle of opposites, yin and yang, and the interrelation of action and reaction within the sphere of life’s possibilities. The birds strive to release themselves from the barbed wire. Each presses its powerful free wing, balancing the other; reaching skyward, they unite in a single desire for freedom. 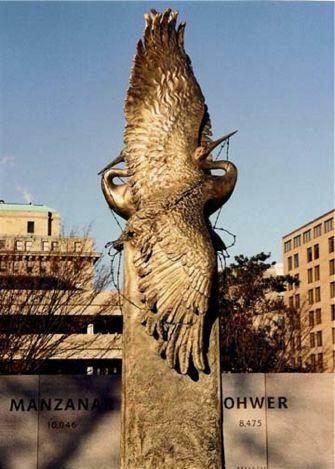 On its tall base, the shape of the birds’ spiraling wings and outward sweep of golden feathers is visible above the stark granite walls. As a shining beacon of hope, it is symbolic of one’s ability to rise above limitations. The symmetrical vertical wings resemble the eternal flame of freedom as they reflect the brilliance of the sun’s rays. At its full height of 14 ft., the sculpture has made a transition from rough textured base to an arc of flaming feathers in a series of sweeping curves. This golden helix of blade-like feathers cutting the sky expresses the constant dance and continuum of life and death, between matter and spirit and the limited and the infinite. It is the place where the extremes are reunited through the power of their distance. It is the place of transcendence and oneness. The suffering experienced through the episodes of the tragedy of Japanese Americans are not accidents or occasional incidents, but have proven to be constant throughout the history of human life. Therefore, as an individual, community or nation, our survival and evolution depend on our ability to remember and honor the struggles of the past---while being consciously engaged in the heartfelt challenges of the present, as we remain optimistic for the future.